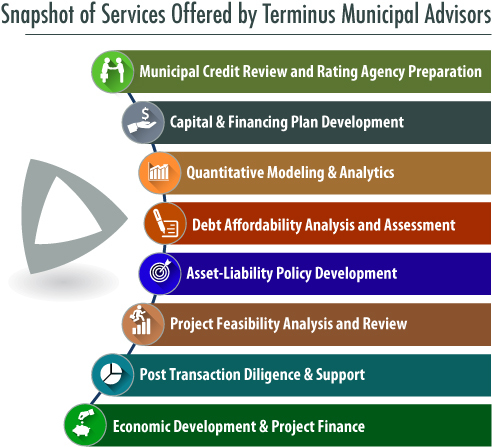 Terminus Municipal Advisors, LLC provides independent municipal and financial advisory services to organizations seeking to utilize the municipal capital markets. We offer advice and assistance to a variety of institutions including state and local municipalities, higher educational institutions, utilities, and non-profit organizations throughout the country. In accordance with industry regulations, our firm is registered with the U.S. Securities and Exchange Commission and the Municipal Securities Rulemaking Board.Our municipal advisory affiliate offers our clients a full range of capital market services including debt policy creation, financial analysis of current debt and credit ratings, long-term strategic planning, and transaction based services involving the sale and marketing of municipal debt related products in the capital markets. Given our unique operating history as an investment bank, financial advisor and management consultant firm, we have been directly involved in all aspects of municipal operations and the use of capital markets to meet its financial goals and objectives. We offer a comprehensive, independent and thorough process and approach in developing industry leading solutions to meet our customer needs. We will continue to strive to understand your business and operating environment in an effort to provide you with options and results that matter most to you. The municipal finance advisory staff possesses a wide range of experience in general obligation, utility, healthcare, education, housing, transportation and other specialized financing techniques for tax exempt issuers and has created innovative financing ideas for its clients to meet their particular needs. We offer more than 70 years of collective team experience in all facets of the industry. We have direct experience as governmental finance officers, certified public accountants, investment bankers and management consultants. In accordance with regulations promulgated by the U.S. Federal government with the passage of the Dodd-Frank Act, we have registered with the U.S. Securities and Exchange Commission and the Municipal Securities Rulemaking Board as an independent municipal advisor. As the regulatory landscape related to these activities continues to evolve for our firm and our clients, we are committed to maintaining an environment to maintain compliance with regulations and concurrently, exceed those established by our clients.